Title: How Do Portfolio Weighting Schemes Affect Commodity Futures Risk Premia? We examine whether and to what extent successful equities investment strategies are transferrable to the commodities futures market. We investigate a total of 7 investment strategies that involve optimization and mean-variance timing techniques. To account for the unique characteristics of the commodity futures market, we propose a novel method of classification based on momentum or term structure properties in the formation of long-short portfolios in conjunction with the quantitative strategies from the equities literature. Our strategies generate significant excess returns and risk-adjusted performances as measured by the Sharpe and Sortino ratios and the maximum drawdown. We find no significant correlation between the strategies’ excess returns and common risk factors. There is no evidence that excess returns are a compensation for liquidity risk. The strategies are robust to transaction costs and choice of model parameters and exhibit stable performance across various market environments including times of financial crises. "There are theoretical and empirical reasons to believe that commodity futures investments command positive risk premia. The theoretical considerations relate either to the theory of storage where the risk premium depends on inventory levels, and thus on the slope of the forward curve, or to the hedging pressure where the risk premium is a function of hedgers’ and speculators’ net positions. These theories have been empirically validated in numerous empirical studies, all of which highlight that futures returns depend on the fundamentals of backwardation and contango. In all of the empirical studies, the scheme employed to weight commodities within a portfolio is equal-weighting. The rationale for this choice comes from the fact that unlike in equity markets, there is no natural value-weighting that can easily be applied; its equivalent (production and consumption weighting) is hard to implement given how difficult it is to collect reliable inventory data. This paper proposes to relax the assumption of equal weights and to test whether weighting schemes emanating from the equity literature could be more profitable. These weighting schemes pertain to mean-variance optimization and volatility timing. Our first contribution is to apply the weighting schemes of the equity literature to the commodity markets. In total, eight weighting schemes are considered; these can be split into an equal-weighting scheme, two optimization schemes, and five timing schemes. The equally weighted scheme is standard in the commodity pricing literature. The optimization strategies follow Markowitz (1952) and are based on mean-variance (MV) and minimum variance (MIN). When it comes to the timing strategies, three approaches follow Kirby and Ostdiek (2012) and define portfolio weights based on volatility timing (VT), beta timing (BT), and reward-to-risk timing (RRT); the other two are novel and based on tail risk as modeled via Value-at-Risk (VaR) and conditional Value-at-Risk (CVaR). Our second contribution is to amend the aforementioned weighting algorithms so as to consider the specificities of backwardation and contango that prevail in commodity futures markets. We do that by adding a novel step to the weighting procedure that considers either past performance or the slope of the term structure of commodity futures prices as a buy or sell signal for each of the commodities present in the cross section at the time of portfolio formation. This method allows for the possibility of being either long or short while mitigating common issues such as extreme weights or artificial inflation of returns due to the self-financing nature of long-short positions. Our findings indicate that the optimization-based and timing strategies perform well, as measured by a range of risk-adjusted return metrics (Sharpe and Sortino ratios, Maximum Drawdown, and VaR and CVaR). We find no evidence that returns from the investment strategies are compensation for liquidity risk. Our investment strategies are robust to transaction costs and the the choice of model parameters. We show two alternative methods of classifications, that nominate commodity futures for long or short positions based on momentum and term structure, exhibit similarly strong performance. We also show that our strategies are stable in various market conditions, from crisis to high growth periods. we document that these strategies are amongst the most profitable in the literature and show that common risk factors in the commodity futures market are unable to account for their positive and significant excess returns." Title: Factors vs. Sectors in Asset Allocation: Stronger Together? duplicate all the trials for long-only portfolios (no short sales) and long-short ones (unlimited short sales accepted). Our contest reveals no overall winner. In fact, we find circumstantial evidence of superiority for each style. The alphas of factors with respect to the market inflate expected returns, while sectors reduce risks through high diversification potential. Factor investing tends to dominate when short sales are permitted. By contrast, when short-selling is excluded, industry based allocation is preferable, especially for highly risk-averse investors. These balanced results lead us to conjecture that factors and sectors could be complementary investing styles, and that combining them should help enhance financial performance, at least under some configurations regarding short-selling and/or risk aversion. First, during crisis periods, a mixture of sectors and factors largely dominates whichever style is the best standalone performer. Second, moderately risk-averse investors will find it best to combine sector and factor investments." 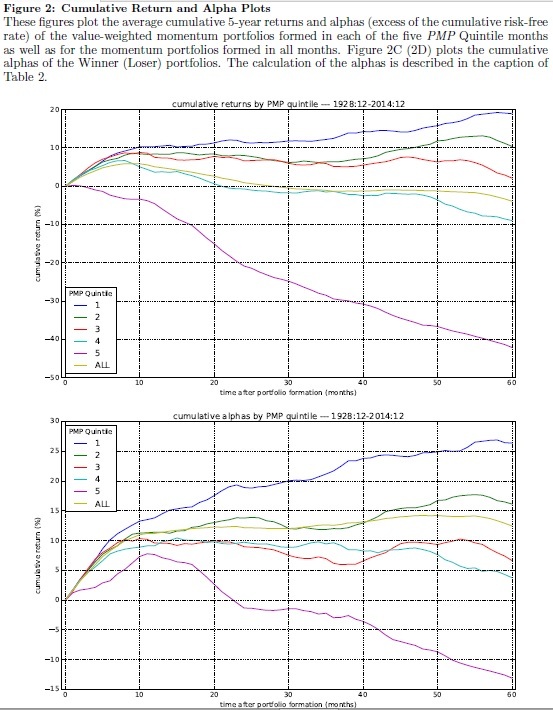 Motivated by behavioral theories, we test whether recent past performance of the momentum strategy (Past Momentum Performance--PMP) negatively predicts the performance of stale momentum portfolios. Following periods of top-quintile PMP, momentum portfolios exhibit strong reversals 2-5 years after formation, whereas, following periods of bottom-quintile PMP, stale momentum portfolios earn positive returns. The difference in cumulative five-year Fama-French alphas for momentum portfolios formed in high- and low-PMP months is 40%. A value-weighted trading strategy based on this effect generates an alpha of 0.40% per month (t = 3.74). These patterns are confirmed in international data. These findings present a puzzle for existing theories of momentum. "A set of studies propose behavioral hypotheses to explain the momentum anomaly. An implication of some of these models is that the momentum phenomenon is a result of delayed overreaction to certain information shocks. This implies that a sufficiently `stale' momentum portfolio, where `stale' refers to a momentum portfolio formed at a lag of twelve months or more, will on average earn negative abnormal returns. However, to our knowledge, no study has yet examined the conditional variation in the performance of stale momentum strategies, i.e., the performance of momentum portfolios in years 2-5 post-formation. One interesting possibility, motivated by the idea that investors chase past style performance, is that strong recent past performance of the momentum style will cause investors to overvalue new momentum portfolios, resulting in poor subsequent long-run performance of these portfolios. In this paper, we explore this issue by testing whether long horizon performance of momentum portfolios is negatively related to the performance of the momentum strategy in the recent past. nding is that momentum portfolios formed in high PMP months (months when PMP is in the top 20% of all months in our sample) generate strongly negative returns and alphas 2-5 years after formation. Strikingly, momentum portfolios formed in low PMP months continue to (weakly) outperform in post-formation years 2-5. Thus, the momentum reversal documented by Jegadeesh and Titman (2001) is strongly state dependent. We explore a set of behavioral hypotheses for the strong dependence of stale momentum performance on PMP. One of our hypotheses is based upon style chasing. A basic hypothesis is that the performance of the momentum style will tend to continue in the short run, so that after the momentum strategy has done well, it tends to do well again. The style chasing approach suggests that following high returns on the momentum style, owing to return extrapolation, naive investors switch into this style, meaning that they buy winners and sell losers heavily. This trading pressure reinforces the strong performance of the momentum strategy, and will temporarily cause better-than-usual momentum performance after the conditioning date if such return chasers arrive gradually. ffect is driven by overreaction in the components of the momentum portfolio. In consequence, the returns on the momentum portfolio will eventually reverse. So after high PMP, there are on average negative returns to a stale momentum strategy of buying firms that were winners at least a year ago and selling firms that were losers at least a year ago. In contrast, after low PMP, investors switch out of the momentum style. Heavy selling of winners and buying of losers induces underreaction in winner and loser returns. So after low PMP, this hypothesis implies eventual positive returns to a stale momentum strategy. Putting these two cases together, we expect reversal of momentum to be stronger as PMP increases. We introduce a new approach to algorithmic investment management that yields profitable automated trading strategies. This trading model design is the result of a path of investigation that was chosen nearly three decades ago. Back then, a paradigm change was proposed for the way time is defined in financial markets, based on intrinsic events. This definition lead to the uncovering of a large set of scaling laws. An additional guiding principle was found by embedding the trading model construction in an agent-base framework, inspired by the study of complex systems. This new approach to designing automated trading algorithms is a parsimonious method for building a new type of investment strategy that not only generates profits, but also provides liquidity to financial markets and does not have a priori restrictions on the amount of assets that are managed. - the splitting of directional change and, consequently, overshoot thresholds into upwards and downwards components, i.e., the introduction of asymmetric thresholds." QuantInsti™ is one of the pioneer algorithmic trading research and training institutes across the globe. With its educational initiatives, QuantInsti™ is preparing financial market professionals for the contemporary field of algorithmic and quantitative trading. They offer a really well-prepared professional training course EPAT™ (Executive Programme in Algorithmic Trading) which is Asia's first algorithmic trading education program. This comprehensive course exposes its participants to various strategy paradigms and enables them to build an algorithmic trading system. QuantInsti™ also offers Quantra™ which is an e-learning portal that specializes in short self-paced courses on algorithmic and quantitative Trading. Quantra™ offers an interactive environment which supports 'learning by doing' through guided coding exercises, videos and presentations. The original academic paper (“Industry Information and the 52-Week High Effect”) has been authored by Xin Hong, Bradford D. Jordan, and Mark H. Liu. They propose a modified rotational momentum strategy which uses a 52-Week High as a predictor of cross-sectional equity performance to select top performing industries. Milind Paradkar from QuantInsti performed an independent analysis of a resultant strategy during last 3 years (an out of sample period from 2014 until 2017) on Indian stocks. 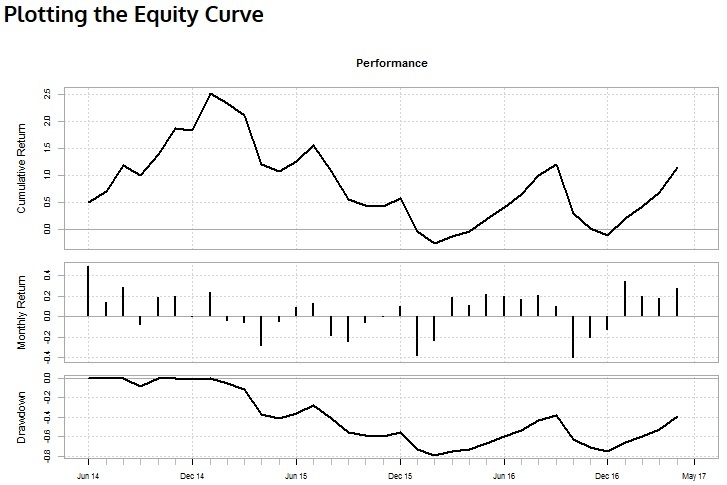 Overall, the performance isn't very stellar and we can say that Indian market hasn't been very generous for this strategy (total performance has been only 17% flat over those 3 years with a Sharpe ratio around 0.4). But we are really glad for this analysis as it offers a valuable look on a strategy on different universe as most trading strategies are usually academically researched only on US equities.